The economic superpower of 2038, Australia has triumphed during the crises that have ruined a world. Aussies eat "real" (non-algae) food, drive petrol-guzzling cars, and support national and regional duel circuits. But how can visitors to the Land Down-Under know what perils await? Consult . . .
Australia is the fourth volume – following The East Coast, The West Coast, and The South editions – of an ambitious project by your American Autoduel Association. 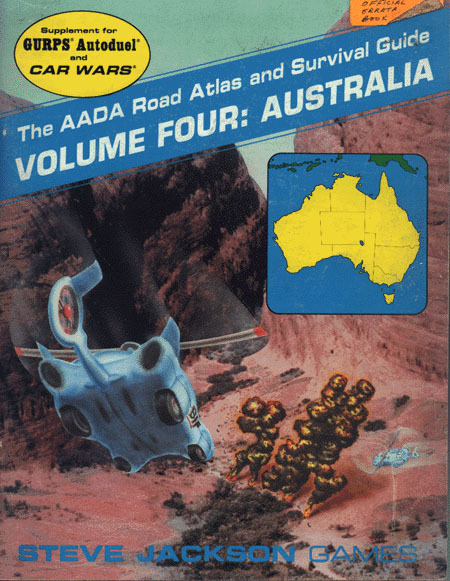 The AADA Road Atlas and Survival Guide will tell you everything you need to know about this continent-sized nation, including: roads, politics, police, quarantine regulations, and which truck stops are overpriced. Triad and the Khmer Noir. Does a refugee-liberation organisation really exist? Has an Oriental crime syndicate penetrated Australian society? Plus more! The AADA's first guide to Antarctica! A dictionary of Aussie slang! The Contests of Stomach form – no tourist should be without this! Complete fuel rules for petrol (for GURPS Autoduel), and ethanol.